The flag of Puerto Rico Olympic Committee is white with logo. The flag of the CPPR can be seen at https://twitter.com/ComiteOlimpico/status/989522693191061504; it is https://www.paralympic.org/on a white background. 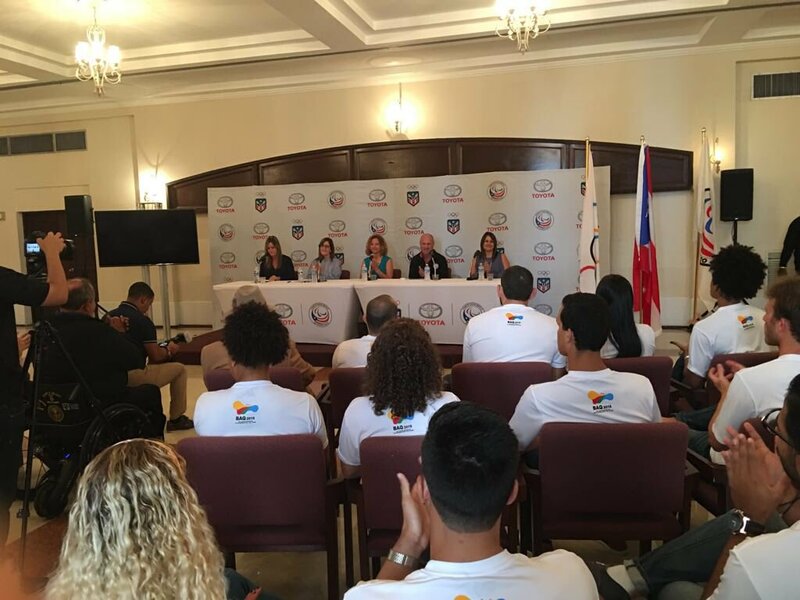 The "Comité Paralímpico de Puerto Rico, COPAPUR" (English: Puerto Rico Paralympic Committee) was established in 1995, although the country's first official participation in a Paralympic event was in 1988." Regarding the actual flag, Zach mentions the following URL (https://twitter.com/ComiteOlimpico/status/989522693191061504), which is a tweet from the Comité Olímpico PUR (English: Puerto Rico Olympic Committee official Twitter account ( @ComiteOlimpico, https://twitter.com/ComiteOlimpico). In fact, that tweet shows a picture (https://pbs.twimg.com/media/Dbt9pEUW0AIehEl.jpg) in which a set of three flags is seen, from left to right: Olympic Flag, Puerto Rico flag and Puerto Rico Paralympic Committee (obverse). 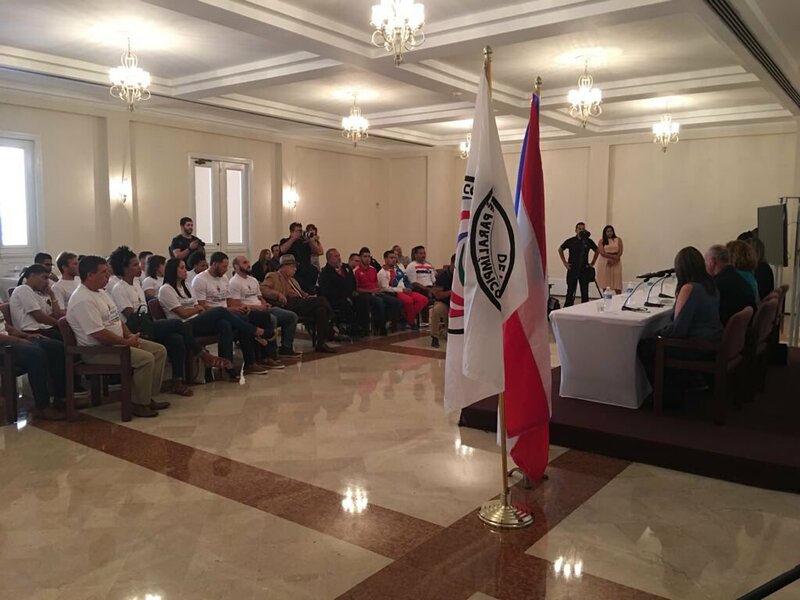 Here's also another picture (https://scontent.feoh4-2.fna.fbcdn.net/, source: https://www.facebook.com/PURParalimpico) which displays the Puerto Rico Olympic Committee flag (third flag from left to right) in a more visible angle. And here's another picture (https://pbs.twimg.com/media/Dbt9pksW4AUFsCW.jpg, source: https://twitter.com/ComiteOlimpico/status/989522706554081281) showing the Puerto Rico Paralympic Committee (reverse) flag on the foreground. The GIF version of the flag is as he mentioned, found here (obverse): https://www.paralympic.org/ (source: https://www.paralympic.org/puerto-rico). Before the coming Olympic games in Beijing, Russian TV started series of sport programs about former Olympic games. Yesterday I saw a report about XIV games in 1948. Puerto Rico team used white flag with seal and red inscription "Puerto-Rico". Puerto Rico marched with the US flag and with a unknown flag as seen in this photo. You have an idea of which flag it is? I saw a similar flag (could be the same) flown during an Olympic parade. it was white with a seal in the middle and the full name of Puerto Rico at the top. 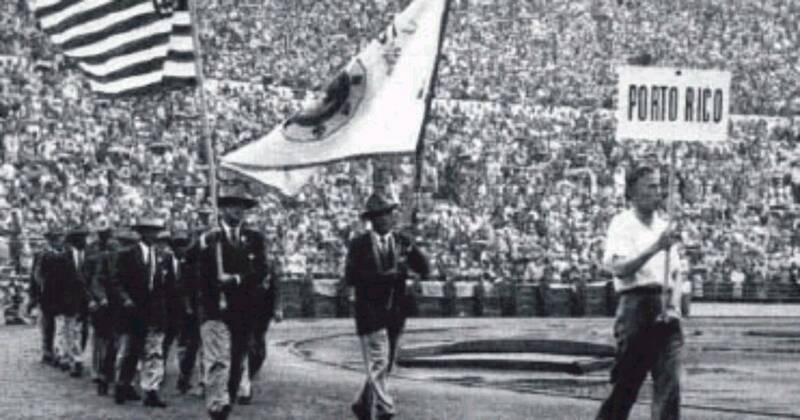 The Official Report of the 1952 Olympic Games in Helsinki at www.aafla.com states: "....Puerto Rico after having used the U.S.A. flag on the arrival of her team in Helsinki, acquired while the Games were in progress the national flag to which her new independence entitled her." I'm presenting you very proudly the flag of our local soccer association of the PR central region, with headquarters at my city of Caguas. It is called the Puerto Rico Soccer Central Association (A.C.B.P.R. - Asociación Central de Balompié de Puerto Rico.) It was founded in 1980, at Caguas by Prof. Mickey Jiménez. The flag is a light orange - white - yellow vertical triband of equal widths, with the Association logo at the center of the white band. The logo consists of a typical Spanish shield, square at the top and semicircular at the bottom, quartered by a double cross of equal lengths, white the top one over a very dark blue one, the last thrice the width of the first. The first and third quarters are dark gray; the second and fourth quarters light blue. At the center of the cross is a typical soccer ball, with white hexagons and very dark blue pentagons, in such a position that an upright pentagon is facing forward. At the top of the shield, at its right and left extremes, are two very dark blue small solid circles, and between them is written in capital letters "FUNDADA EN 1980" (founded in 1980). Above it, in very large capital letters, defaced by four white lines in descending order of width and starting at the center of the letters, is written "ACBPR" (the Association's Spanish initials.) Bordering the shield from its upper right side through its upper left side are the words "ASOCIACION CENTRAL DE BALOMPIE DE PUERTO RICO." All the letters are in very dark blue color. The Association is really a big social arena - or oratorical, as Prof. Jiménez likes to say - focused in pulling young children and adolescents away from the streets and its associated viciousness and moral corruption. The mission: to promote and offer innovative and excellent programs for the encouragement and development of organized soccer, taking as fundamental basis the sport moral ethics and the emotional, social and spiritual aspects and needs of the participants and their families, in such a way that it brings about for them effective benefits toward a better quality of living. Goal: to become completely effective, by means of its soccer and other special programs, in the spiritual and humane shaping of the participant children, youngsters and adults population, and to be an example of integral well-being for future generations. Values: to care with dedication for the needs of our member-players and its community, as they would require, and their social, psychological and spiritual needs, through the teaching-and-learning process of soccer, based on the effort, respect and love toward their essential being and dignity. The burgee of "Federación de Vela de Puerto Rico" can be seen on the Federation website. The burgee is based on the Puerto-Rico national flag. It is red with a blue triangle charged with a white star placed along the hoist. The triangle is fimbriated in white and there is also an horizontal white stripe spreading all over the red field and connected to the triangle fimbriation. At this same Federation website you can see a small rendition of a burgee identified as the Puerto Rico's Nautical Club (Club Náutico de Puerto Rico.) This burgee is completely different to the one shown by José Alegría in his Nautical Flags website. I cannot attest about the official status of this burgee. This could be a new flag, substituting the one on Alegría's.